SynCAM 1 (Synaptic Cell Adhesion Molecule 1), a member of the immunoglobulin (Ig) superfamily of proteins, is an intercellular adhesion molecule at synapses in the central nervous system (CNS). It mediates interactions that bridge the synaptic cleft between pre- and postsynaptic membranes. SynCAM 1 has an active role in synaptic differentiation and induces formation of new presynaptic terminals. In keeping with this activity, SynCAM 1 is expressed throughout the developing brain, indicating a general role in synaptogenesis. SynCAM 1 is a member of a family of four genes found solely in vertebrates. The domain structure of all SynCAM family members is well defined. Three Ig-like domains constitute their extracellular sequence, followed by a single transmembrane region and a short cytosolic tail. Their intracellular sequences display an interaction motif for PDZ domain-containing adaptor molecules and for components of the actin cytoskeleton. These cytosolic protein interaction motifs are highly conserved among all four SynCAM proteins, underscoring their important role in mediating membrane differentiation. The first step of synaptic differentiation is initiated by axo-dendritic contact. This physical contact between incoming axons and postsynaptic targets initiates clustering of synaptic vesicles indicative of the formation of presynaptic terminals1. Two key roles of adhesion molecules in this process can be distinguished. First, they confer the specificity of synaptic contacts. Second, they can affect formation of synaptic specializations. Studies of these processes have highlighted various functions of the Ig superfamily in synaptic differentiation. Ig superfamily members have diverse roles in extracellular recognition and perform important functions in the vertebrate and invertebrate CNS2,3. They have critical roles in axon guidance4-6 and affect synaptic plasticity (see Chapters 3, 5, and 6). The roles of Ig superfamily members in synaptic differentiation were illustrated by studies of axon fasciculation in insects, which identified the membrane protein fasciclin II (Fas II)7,8. Fas II contains five extracellular Ig-like domains followed by two fibronectin repeats. It engages in a homophilic interaction at Drosophila neuromuscular junctions, and determines growth, maturation, and morphology of neuromuscular synapses9,10. Importantly, muscle-cell expressed Fas II controls the patterning of synaptic input11, and affects both specificity and maturation of neuromuscular synapses in Drosophila. Fas II has similar functions at central synapses in Drosophila11. Important roles of Ig superfamily members in the spatial definition of specific synaptic sites were recently identified in the nematode C. elegans and in the vertebrate retina. In C. elegans, the motor neurons that express the Ig superfamily member SYG-1 make synapses only with certain neurons and muscle cells. This specificity is directed by epithelial guidepost cells expressing the SYG-2 protein, which interacts in a heterophilic interaction with the neuronal SYG-113,14. In the vertebrate retina, an analogous function in target recognition is exerted by the Sidekicks proteins, synaptic membrane proteins with six extracellular Ig-like domains, and 13 fibronectin repeats. Sidekicks are differentially expressed within retinal ganglion cells, and their homophilic interactions specify synaptic connectivity in distinct retinal laminae15. Together, these studies demonstrate that target-derived Ig superfamily members can control synaptic specificity and differentiation. Studies in vertebrates identified selected adhesion molecules that not only regulate synaptic differentiation, but also demarcate future synaptic sites and directly drive formation of new synaptic membrane specializations. Examples of cell adhesion molecules with both adhesive and inducing functions at synapses are the neurexin/neuroligin proteins (see Chapters 4 and 7, and Figure 8.1). The postsynaptic neuroligins induce presynaptic specializations via binding to neurexins, their presynaptic partners16-18. Different neuroligin family members vary in their ability to induce excitatory and inhibitory presynaptic terminals19-21. Neurexins themselves also can signal the formation of excitatory and inhibitory postsynaptic specializations19. 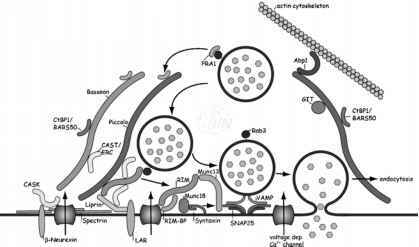 However, biochemical evidence indicated that other adhesion systems exist at central synapses. Biochemical analysis showed that the interaction of neurexin and neuroligin is Ca2+-dependent16, as is the homophilic interaction of cadherins, synaptic adhesion molecules that promote synapse maturation (see Chapter 5). 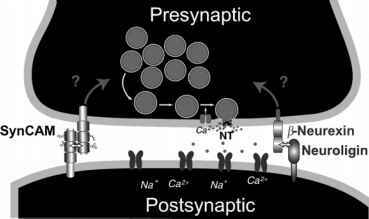 Yet, preparations of nerve terminals remain attached to each other in the absence of Ca2+, indicating that additional adhesion systems exist at the cleft of central synapses. Recent studies of synaptogenesis identified the vertebrate Ig superfamily member SynCAM 1 (Synaptic Cell Adhesion Molecule 1; human gene symbol IGSF4). SynCAM proteins constitute a distinct, Ca2+-independent adhesion system that connects pre- and postsynaptic membranes (Figure 8.1). Importantly, SynCAM combines this adhesive function with the activity to induce presynaptic specializations in the vertebrate CNS. Figure 8.1. Induction Pathways of Synaptic Terminals at Central Synapses. The postsynaptic adhesion molecules SynCAM 1 and neuroligin interact with their presynaptic partner molecules SynCAM and P-neurexin, respectively, in interactions that bridge the synaptic cleft. Presynaptic proteins that interact with SynCAM and P-neurexin then trigger the formation of presynaptic specializations through unidentified signaling pathways (arrows). Both postsynaptic SynCAM 1 and neuroligin are sufficient to induce functional presynaptic specializations containing actively recycling synaptic vesicles that release neurotransmitter (NT) as indicated. domain interaction motifs22. PDZ domains characterize a set of adaptor molecules and typically allow them to bind to the carboxyl termini of membrane proteins, serving important functions in membrane protein scaffolding and targeting23. Ig superfamily members containing a PDZ binding consensus motif. This group of molecules also includes all the invertebrate Ig superfamily members mentioned above that are involved in synaptic differentiation. This analogy of extracellular domains and intracellular sequence motifs drew particular attention to SynCAM 1, and aided its identification as a synaptic adhesion molecule in vertebrates. In addition, SynCAM 1 had been independently identified by other approaches. It was mapped and cloned as a potential tumor suppressor gene26,27. This role was confirmed using SynCAM 1-expressing tumor cells in immunocompromised mice28. These studies indicate that SynCAM 1 could regulate migration, proliferation, and differentiation of non-neuronal cells. SynCAM 1 was also cloned as an Ig domain containing protein expressed in testis during spermatogenesis29 and as retinoic acid-inducible gene from PC 12 cells, which implicates it in neuronal differentiation30. SynCAM 1 is a single-spanning membrane protein (Figure 8.2). SynCAM 1 transcripts are alternatively spliced in the extracellular region (see paragraph 9), and diverse transcripts encode SynCAM 1 isoforms whose lengths vary from 416 to 455 amino acids. The predicted signal peptide of SynCAM 1 is 41 amino acids long. Sequence analysis predicts a molecular weight of 42.0-47.9 kDa for SynCAM 1 protein products of the shortest and longest alternatively spliced transcripts after signal peptidase cleavage, respectively. The extracellular domain of SynCAM 1 is composed of three Ig-like domains, which belong to the V-set, C1-set, and I-set subclasses of Ig-like domains, respectively31 (Figure 8.2). Figure 8.2. Domain Organization of Human SynCAM 1. The figure depicts the product of the longest human SynCAM 1 splice variant. The broken line at left indicates the signal peptidase cleavage site, and hexagons show the predicted N-glycosylation sites in the extracellular domain. The light gray segment marks the extracellular sequence stretch that consists mainly of putative O-glycosylation sites, which varies in length depending on alternative splicing of this sequence. The following black segment surrounded by an indicated lipid bilayer depicts the single transmembrane region. The cytosolic tail contains sequences interacting with the cytoskeletal protein 4.1 and PDZ-domain containing adaptor molecules as indicated. The model is drawn to scale, and the bottom scale bar indicates amino acid numbers. SP, signal peptide; Ig, Ig-like domain; PDZ, PDZ-domain containing protein. Six predicted N-glycosylation sites lie within these three extracellular Ig-like domains. The Ig-like domains of SynCAM 1 are followed by an alternatively spliced O-glycosylation stalk, which can contain different numbers of predicted O-glycosylation sites depending on alternative splicing of the exons encoding this region (see paragraph 9). Splicing is conserved between human and mouse orthologs31, but the functions of this conserved splicing in the O-glycosylation stalk are not yet known. In agreement with these predicted glycosylation sites, SynCAM 1 protein is post-translationally modified with carbohydrates in brain, and N-glycosylation at multiple sites in the Ig-like domains increases its apparent molecular weight. Additionally, SynCAM 1 is O-glycosylated in agreement with predicted sites present in different splice variants32. The single transmembrane region is followed by a short, 47 amino acid long cytosolic sequence. This cytosolic sequence of SynCAM 1 contains two identified protein interaction motifs (Figure 8.2). First, a juxtamembraneous intracellular sequence is predicted to interact with members of the protein 4.1 family, which stabilize the assembly of the actin/spectrin cytoskeleton33. This sequence was first analyzed in the erythrocyte membrane protein glycophorin C34-36. Notably, this motif is also present in the neurexin family of synaptic adhesion molecules37. Second, SynCAM 1 displays a sequence at the extreme carboxyl terminus predicted to interact with type II class PDZ domains38. This prediction has been confirmed, and SynCAM 1 is known to interact with the intracellular PDZ-domain containing adaptor molecules CASK, Mint1, and syntenin22. SynCAM 1 homologs are present throughout vertebrate genomes from puffer fish to humans, whereas no evolutionarily related genes could be identified in invertebrates31. It is encoded by the IGSF4 (Ig superfamily member 4) gene, which is highly conserved both on the exon/intron level and in its coding sequence31. SynCAM 1 orthologs display high sequence similarity throughout vertebrate genomes. The high degree of conservation across species is exemplified by the fact that in humans and puffer fish, 71% of the amino acids are identical or highly similar for their two SynCAM 1 orthologs. Human and mouse SynCAM 1 proteins are even more closely related and share 98% sequence identity. SynCAM 1 transcripts are abundant in brain, present in testis, and weakly detected in other tissues29,32,39. During early postnatal development, SynCAM 1 is expressed in all brain regions analyzed so far. Its expression levels in mice increase during the first 2 weeks after birth, the peak period of synaptogenesis in rodents40'41. An antibody raised against the carboxyl terminus of SynCAM 1 shows synaptic staining in immunohistochemistry and immunoelectron microscopy22. This expression of SynCAM 1 throughout the brain indicates a general role for this adhesion molecule at synapses in the developing CNS. SynCAM 1 is sufficient to induce neurons to form functional presynaptic specializations and its expression in neurons promotes synaptic transmission22,42. SynCAM 1 induces presynaptic specializations. First, immunostaining of these co-cultures for presynaptic marker proteins demonstrates that the neurons develop specializations containing synaptic vesicle proteins at contact sites with SynCAM 1-expressing HEK293 cells (Figure 8.3). Quantitative analysis confirms that this effect is specific22. Second, optical imaging studies of live co-cultures of SynCAM 1-expressing HEK293 cells with cultured neurons show that the specializations induced by SynCAM 1 contain actively recycling vesicles22,42. These experiments utilize FM styryl dyes to monitor synaptic vesicle endo- and exocytosis44. The quantum yield of FM dye fluorescence is highly increased when the dye partitions into a hydrophobic environment such as the membrane of a synaptic vesicle. In these live cell imaging experiments, FM dyes are added to dissociated neuronal cultures. Simultaneously, synaptic vesicle release is stimulated by depolarization. FM dyes are endocytosed within the lumen of synaptic vesicles, where their fluorescence is detected. Consequently, presynaptic terminals containing actively recycling synaptic vesicles are labeled. This approach allows optical imaging of synaptic vesicles and estimation of the size of synaptic vesicle pools in presynaptic specializations. Subsequent to dye loading, the kinetics of synaptic vesicle recycling can be determined in dye release experiments45. Optical FM dye imaging studies reveal that the specializations formed by neurons atop SynCAM 1-expressing HEK293 cells contain recycling vesicles that endocytose FM dyes during stimulation of synaptic vesicle release22,42. Significant amounts of FM dye are loaded into these specializations, indicating that their vesicle pool size is considerable. Furthermore, the neuronal specializations induced on top of SynCAM 1-expressing HEK293 cells have synaptic vesicle recycling properties remarkably similar to presynaptic terminals formed between neurons. SynCAM 1 is therefore able to induce presynaptic specializations containing actively recycling synaptic vesicles with properties highly similar to those found at normal synapses formed between neurons. Third, the function of SynCAM 1 in synaptic differentiation is shown by the reconstitution of synaptic transmission in vitro. The optical imaging studies described above strongly indicate that the presynaptic specializations induced by SynCAM 1 release neurotransmitter onto the surface of the HEK293 cells, as they contain synaptic vesicles undergoing exocytosis. This was tested and confirmed using a modified co-culture assay. This assay employs HEK293 cells expressing both SynCAM 1, to induce presynaptic specializations, and the glutamate receptor subunit GluR2, to detect neurotransmitter released from excitatory presynaptic terminals. Patch-clamp recordings from these HEK293 cells in co-culture with neurons show that evoked responses can be detected under conditions of SynCAM 1 and GluR2 co-expression22. These experiments were the first to reconstitute synaptic transmission. This reconstituted system furthermore allows detection of excitatory miniature potentials42. Together, these co-culture experiments show that target-derived SynCAM 1 induces hippocampal neurons to develop functional presynaptic specializations upon axonal contact. This activity is limited to a few neuronal cell surface proteins. Among multiple cell adhesion and signaling molecules tested, only SynCAM 1 and neuroligins induce presynaptic specializations17,22,42. Figure 8.3. Induction of Presynaptic Specializations by SynCAM 1. (A) Model of the co-culture assay of hippocampal neurons with HEK293 cells expressing SynCAM 1. (B) Three-dimensional reconstruction of a confocal image of a HEK293 cell in co-culture with hippocampal neurons. The HEK293 cell is identified by co-expression of ECFP (gray), and co-cultures were stained for synaptophysin (white) as presynaptic vesicle marker. The image shows an axon displaying diffuse synaptophysin staining (arrows) that traverses a HEK293 cell. Atop this cell, the axon forms multiple presynaptic specializations (arrowheads). In agreement with these results, SynCAM 1 affects excitatory neurotransmission. When overexpressed in hippocampal neurons, SynCAM 1 increases the frequency of miniature excitatory currents recorded from these neurons 2-3 fold22,42. This experimental design is analogous to the co-culture experiments described above, inasmuch as SynCAM 1 levels are increased on the postsynaptic side (contributed either by a HEK293 cell or a transfected neuron). The fact that the amplitude distribution of these responses is unaltered22 indicates an effect by postsynaptic SynCAM 1 on the presynaptic inputs received by the SynCAM 1-overexpressing neuron. This effect of SynCAM 1 on mini frequencies is dependent on neuronal development. It is detectable at the peak of synaptogenesis, but not at later stages when synapses have matured further42. Spontaneous neurotransmission in these cultures increases after the peak of synapse formation (reflected in an increase of mini frequency over time42). These results may indicate a developmental time window during which SynCAM 1 exerts its activity. Alternatively, neurons at earlier stages may be more responsive so that SynCAM 1 can make a difference, and less so as they mature. Notably, SynCAM 1 enhances excitatory neurotransmission of hippocampal neurons but does not affect GABAergic transmission, indicating specific roles in the formation and/or function of glutamatergic synapses42. These results provide insights into the functions of postsynaptically expressed SynCAM 1. In addition, a dominant negative approach permitted identification of presynaptic functions of SynCAM 1 in cultured neurons. Overexpression of the cytosolic tail of SynCAM 1 in neurons, which can be expected to titrate out its endogenous binding partners, results in structural and functional synaptic changes22. Expression of the full-length cytosolic sequence of SynCAM 1 reduces the density of presynaptic puncta in overexpressing cultured hippocampal neurons, and interferes with synaptic vesicle recycling. These experiments demonstrate that the intracellular binding partners of SynCAM 1 have important roles in synapse differentiation and function. The structure/function analysis of SynCAM 1 provides important insights into the domains and protein interaction partners mediating SynCAM activities. All physiological functions of SynCAM 1 that have been identified in neurons depend on its extracellular Ig-like domains, as a mutant lacking the Ig domains is inactive22,42. This mutant of SynCAM 1 lacking the three Ig-like domains does not promote synaptic transmission and does not induce neurons to form presynaptic specializations22,42. These Ig-like domains of SynCAM 1 mediate its homophilic interactions as shown in cell aggregation assays and confirmed by biochemical approaches22. This interact of SynCAM 1 extracellular domains with each other is independent of Ca2+. 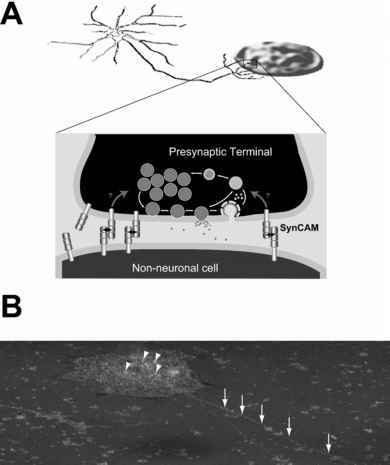 These results clearly demonstrate that the extracellular adhesive interactions of SynCAM 1 are required to mediate its synaptic activities. The importance of the intracellular tail of SynCAM 1 was revealed by mutational analysis. Overexpression of the full-length tail in neurons interferes with presynaptic differentiation and function as described above. Mutant constructs lacking the last three carboxyl terminal amino acids of the SynCAM 1 cytosolic tail, however, are inactive22. This mutation abolishes binding of PDZ domain-containing adaptor molecules to SynCAM 1 as expected22,32. Several PDZ domain-containing adaptors are known to bind the cytosolic sequence of SynCAM 1, including CASK, Mint1, and syntenin22. CASK and Mint1 also bind to neurexins and are part of a tripartite complex that could link synaptic adhesion and the synaptic vesicle recycling machinery46,47. Syntenin binds to several other membrane and signaling proteins in addition to SynCAM 1. It is not known which of these molecules are the main interaction partners of SynCAM 1. Several parallels between SynCAM and neurexins exist at the molecular level. Both proteins presumably drive presynaptic differentiation through interactions of their cytosolic tails (see Figure 8.1). Interestingly, their carboxyl terminal sequences are highly similar, and neurexins bind and recruit similar proteins to the plasma membrane, including Mint1, and CASK, itself binding several other adaptor molecules46,48. One of the molecules recruited by CASK is protein 4.137, a component of the cytoskeleton that promotes formation of actin/spectrin filaments33. A physical connection to cytoskeletal components is a feature common to adhesion molecules, and the protein 4.1 link can confer this property to SynCAM and neurexins alike. The parallels in the intracellular protein binding properties of neurexins and SynCAM make it likely that both engage overlapping presynaptic signaling pathways. Their extracellular domains, however, are not related, providing an example of how different proteins can perform analogous functions by means of shared protein interactions. Bioinformatic analysis revealed the SynCAM family as a new group of vertebrate-specific immunoglobulin superfamily members that comprises four genes31. The four SynCAM genes encode highly similar single-spanning membrane proteins with the same overall domain organization (Table 1). All SynCAM family members contain three extracellular immunoglobulin-like domains of the V-set, C1-set, and I-set subclasses. Their extracellular domains are related to each other but somewhat diverse in sequence. The intracellular sequences of all four SynCAM proteins, however, are very highly conserved. This indicates that the intracellular protein-protein interaction motifs play an important role for their functions. As SynCAM genes have been identified in different physiological contexts, several protein names can be found in the literature for the members of this family. Genes and splice products encoding the SynCAM 1-4 proteins have now been clarified in a unified nomenclature31. Table 1. Sequence Similarities of Human SynCAM Proteins. Numbers indicate percentage of amino acids identical or highly similar between family members. Similarities were calculated as described31.